Why Isn't Dora Russell Better Known? From the files of The Gazette March 21, 1996. Dora Oake was born March 7, 1912, at Change Islands, where she received her early education. While she was still at school her parents moved to St. John's where her father began to operate a small grocery store at the corner of John and Casey streets. She finished high school at Bishop Spencer College, and after completing a teacher-training course at the Normal School, accepted a teaching position at St. Mary's Church of England School, Southside, St. John's, in 1933. That year was a momentous one in Dora Oake's life. In addition to attaining her first teaching position, in the summer of 1933 she met Ted Russell. After a year-long courtship, they were engaged in the summer of 1934 and married on Jan. 6, 1935, at St. Thomas' Church of England Church, St. John's. She left her teaching position soon after the marriage, and in the fall of 1935 the Russells took up residence at Springdale where Ted had been appointed magistrate. They lived there until 1939, followed by a year in Harbour Breton and then from 1940 to 1943 in Bonne Bay. During that time they became the parents of four daughters, Rhona, Elizabeth, June and Peggy. In 1943 they moved back to St. John's where Ted had accepted the position of director of co-operatives with the Commission of Government. Back in St. John's after an eight-year absence, Dora Russell was eager to get back to work despite having four small children to raise. Many people would have considered homemaking a full-time occupation in itself, but Dora was determined to raise a family and have a career. Late in 1945 she was appointed as the first women's editor of the St. John's newspaper The Evening Telegram. This position did not restrict her to cooking, sewing or household hints columns, nor did it limit her journalistic endeavors to stories dealing only with women. As women's editor she instituted an editorial column entitled The Women's Angle which she wrote daily for the women's page. She introduced the regular Saturday feature Woman of the Week, which celebrated the activities and accomplishments of prominent local women. She also wrote two other regular columns -- Day by Day, a fictional diary account of a small family told from the wife/mother viewpoint, and Spectatler by Portia, a commentary column on local events. She also had a regular reporter's beat and during 1946 and 1947 she covered the proceedings of the National Convention for the paper. She retired from The Evening Telegram in 1949, but she did write a regular weekly column on stars for that paper during the 1960s, entitled All About Stars; it ran for approximately 10 years. She also spent a number of years as women's editor of The Daily News in the 1950s, and in 1956 gave birth to her fifth child, son Kelly. Her interest in stars served Dora Russell well. As a long-time leader with the Girl Guide movement, she used her knowledge to instruct girls in the skills necessary to earn their Astronomy Badge. She was a founding member of the Royal Astronomical Society, St. John's Centre Branch, and was presented with the coveted service award of the Royal Astronomical Society for her commitment to their work. Her work with the Girl Guides also brought her the Queen's Medal. Much of Russell's writing involved the constraints of producing copy for newspaper columns but she did not restrict herself to that medium. She was a writer of short fiction, winning second prize in the Margaret Duley Fiction Contest, sponsored by the Newfoundland Writers' Guild in 1974. Over 200 persons entered that contest. She also wrote plays for both radio and television. She published one book, Day by Day: Pages from the Diary of a Newfoundland Woman (1983), based on her 1940s newspaper column and was working on a second, The Fire Folk, at the time of her death on Feb. 9, 1986. In November 1986, Elizabeth Russell Miller, Dora Russell's daughter and a member of the English department, presented the Centre for Newfoundland Studies with her father's and her mother's papers. 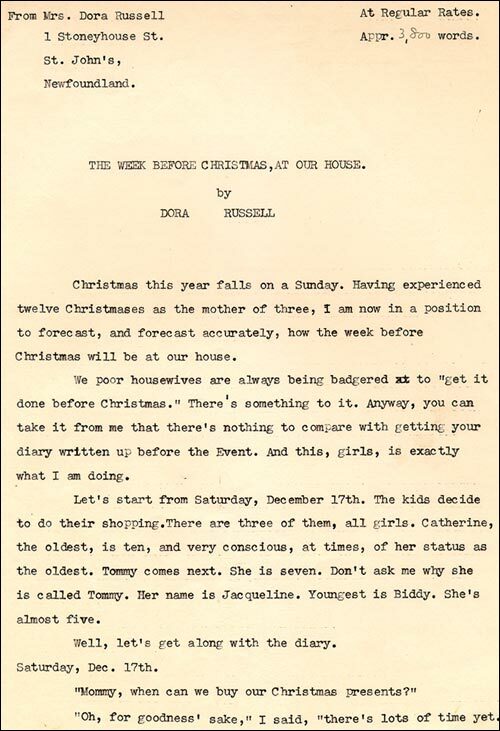 Dora Russell's papers include 10 original short stories, including One Good Turn, which won the Writers' Guild prize, four radio-TV scripts, and copies of most of her newspaper columns from the 1940s. Dora Russell is a little-known and certainly under-recognized Newfoundland writer. As the first women's editor of one of the major St. John's papers in the 1940s, she set a standard for journalism. She refused to condone tokenism or to accept the "easy" assignments which were often given to women reporters at that time. She was determined to combine the careers of homemaker and journalist at a time when it was not the accepted thing for a mother to do. Her writings are a lasting reminder of her commitment to and her success in her chosen profession.